The kitchen does not have to be just a place of culinary experiments. Let your imagination fly also when it comes to arranging your kitchen. 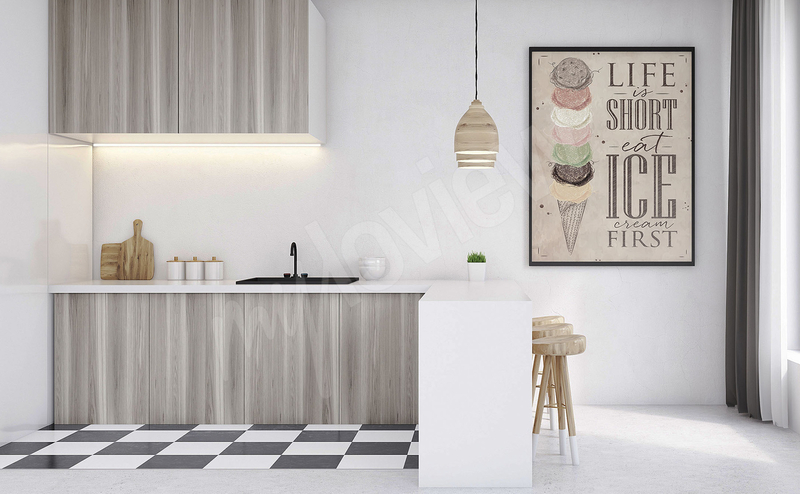 Posters for the kitchen wall are a very attractive and above all practical way to change the character of your interior in the blink of an eye. In the past, adding interest to a kitchen was limited to patterns on ceramic tiles and colorful magnets on the fridge. Nowadays, we can go a step further. 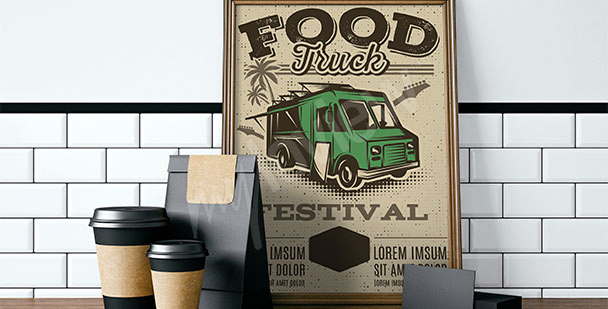 The time has come for eye-catching posters that can depict any of your favorite foods! Food motifs are the most common solution, but not the only one. Retro kitchen posters with references to old-fashioned and antique dishes or photos of aromatic coffee are also a great idea. 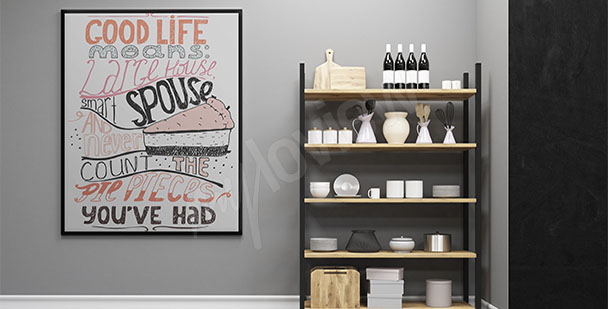 A poster for the kitchen is a modern decorative solution that is worth considering even in classically decorated interiors. A rustic-style kitchen calls for a few vintage elements, for example a poster in a frame. Wall typography art is not just for the living room. Browse our designs for the kitchen above. 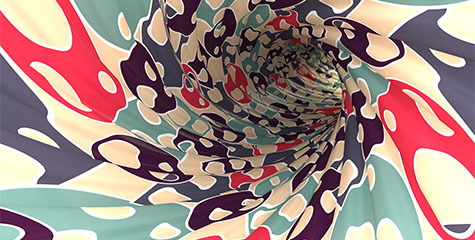 Flowers, abstract images or typography art? 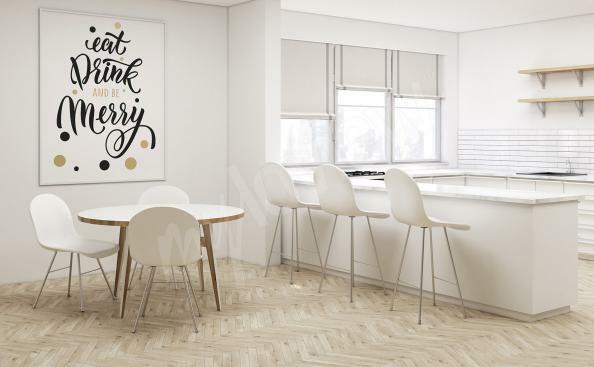 For a modern kitchen, we recommend posters with multi-color inscriptions. Poster instead of a painting? 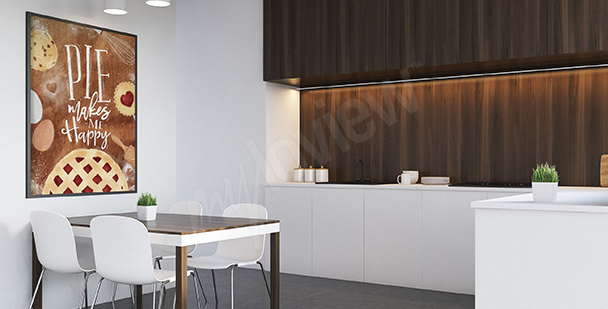 This kind of wall decoration will break up the uniform arrangement of your kitchen. 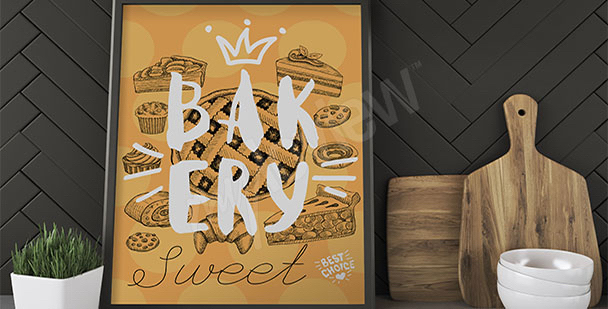 Graphic posters add interest to your kitchenApple pie poster for the kitchen . 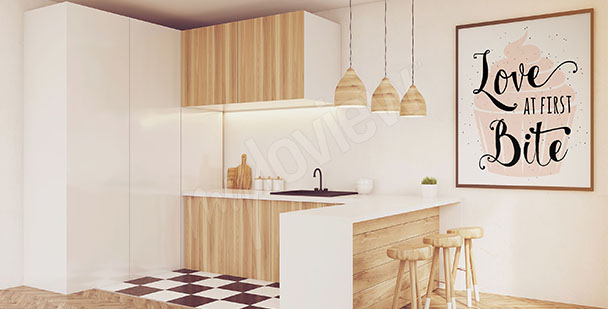 A delicious kitchen design! This poster will definitely draw the attention of our guests. 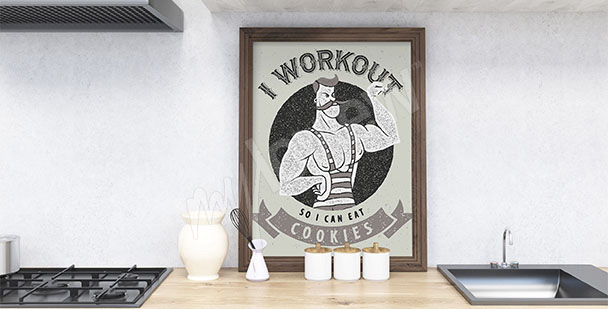 A poster featuring cookies is bound to appeal to all those with a sweet tooth. Hang it in the kitchen or the dining room area. This minimalist, yet very meaningful wall poster should be hung in a visible place in the kitchen. In the art of interior design the idea is key! Mix different styles, for example by adding vintage posters to minimalist accessories. 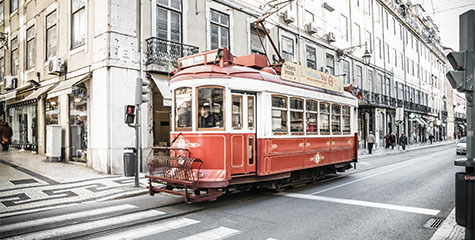 A retro-style poster with a fun design is a perfect present for friends. 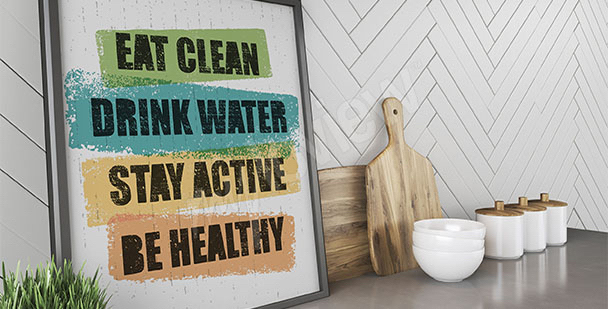 A typographic poster will help you find motivation for healthy living. 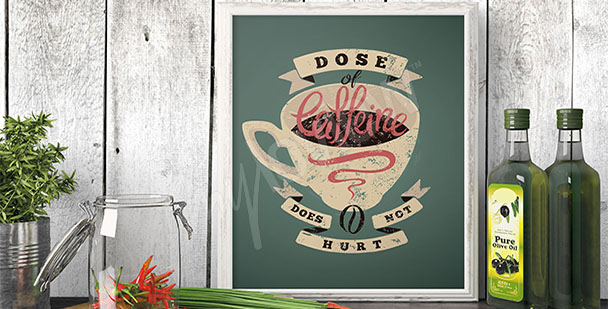 It is a must-have for your kitchen and should ideally be hung next to the fridge. The best place to start when discussing ideas for kitchen decorations is the subject of food. What would a kitchen be without tasty dishes, sweet desserts or juicy fruit? 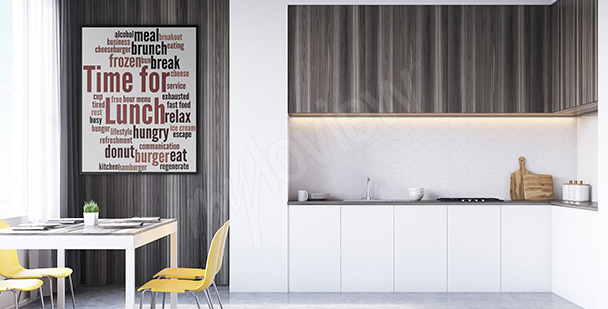 Kitchen posters are the best way to introduce a distinctive accent to your interior, especially when you want the change to be quick and easy. Just choose the pattern you like most, make a purchase and hang it on the wall – maximum effect with minimal effort! 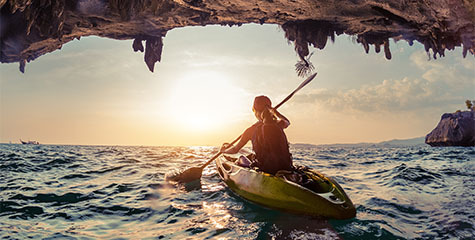 It is worth remembering, however, that the posters should be placed in clear clip frames to protect the pattern and material from moisture, adverse factors and any splashes. And back to the subject of pattern: which one would you choose? Juicy fruit and healthy vegetables – colorful fruit and vegetables are a great way to liven up a monochromatic interior. If the dominant color in your kitchen is beige, gray or navy blue, then yellow citrus fruit, red tomatoes or purple eggplant can be a great color accent that will add energy to your interior. 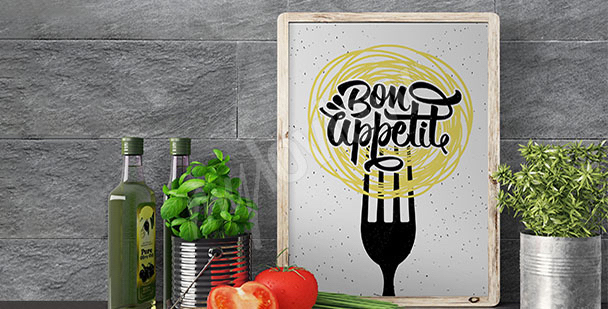 Tasty dishes and appetizing foods – if you are a fan of particular dishes, it's a great idea to opt for posters for the kitchen depicting these foods. Choose a design featuring silvery fish, juicy meat or firm and bouncy pasta in a truly artistic way to not only decorate your kitchen, but also get inspired to new culinary experiments! Delicious sweets for anyone with a sweet tooth – a poster featuring a frosted cupcake, a bar of chocolate, marshmallows or homemade ice cream is a real feast for the eyes. If you love sweets, we certainly do not have to convince you to choose this form of decoration. 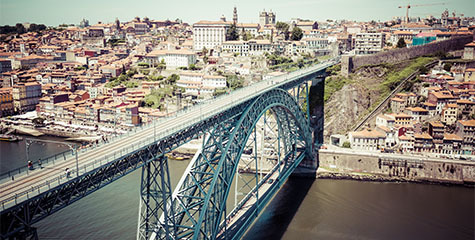 Another advantage is that it also introduces a fun and optimistic accent to the interior. Aromatic spices – the secret behind the flavor of many dishes is a blend of carefully selected spices and herbs. Colorful peppercorns, pink salt, turmeric or cinnamon, as well as dried basil, oregano or thyme – no kitchen can do without them. And when it comes to kitchen posters, spices and herbs will add flavor to your interior design! The kitchen is associated with food and ... delicious, aromatic coffee, which brings us back to life in the morning. Instant or Turkish, ground or in the form of beans, black or with milk – everyone has a favorite type of coffee with which to start the day. 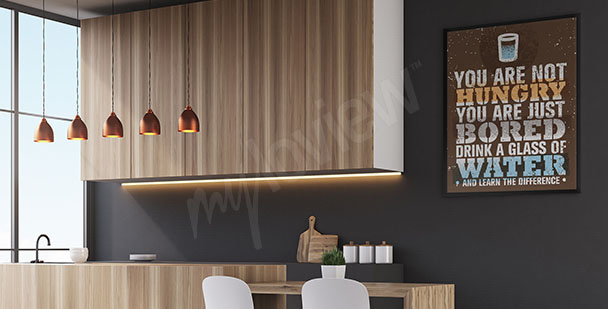 With posters for the kitchen you can enjoy the view of your favorite coffee before you even put the kettle on or turn on the coffee machine. Posters with shiny coffee beans or graphic illustrations of a recipe for a particular type of coffee will also look amazing. 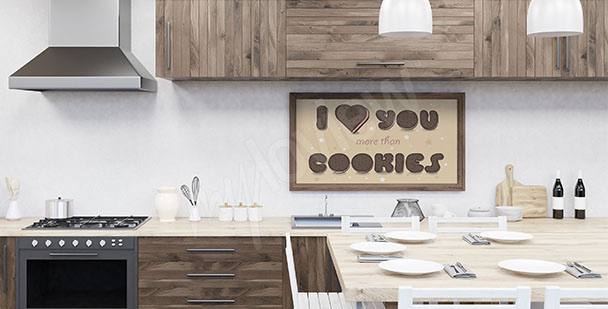 A classically decorated kitchen, with accents borrowed from the past, will look fantastic with retro kitchen posters. 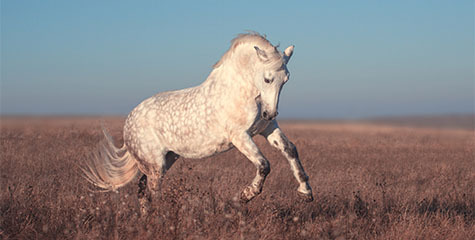 The range of possibilities is vast. 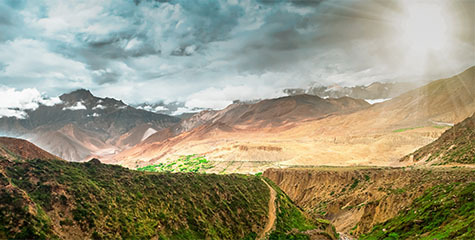 You can choose scenic nature views, which thanks to the use of filters resemble old photographs or slightly faded holiday postcards. An excellent option is also a poster featuring an artistic take on antique china tableware or silver cutlery used by kings and aristocracy. Another retro style option are pictures of plants, fruit and vegetables that resemble engravings from old plant encyclopedias. 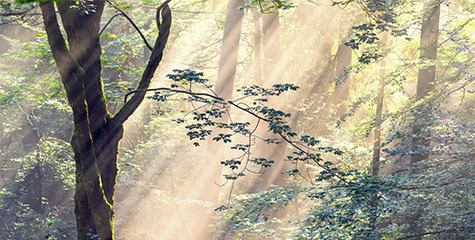 Choosing the right solution is a real challenge! And last but not least: floral motifs. Not only because they are associated with nature and everything fresh and natural, but also because many flowers are used in the kitchen on a daily basis. 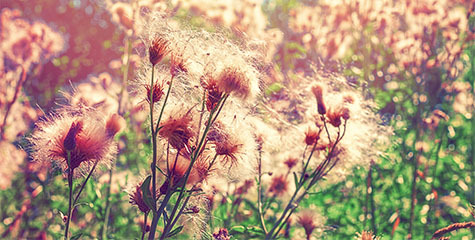 Examples may include poppy, sunflower or even sweet and aromatic vanilla. A poster can therefore feature not only previously mentioned plants, but also flowers whose petals are not only edible, but also delicious such as violets, jasmine, hibiscus, clover or zucchini and pumpkin flowers.